There are two things that are unavoidable in life: death and taxes. Subscribers to The Bauman Letter will find out how to alleviate the impact of the latter in December, when my colleague Ted Bauman puts the new tax plan under the microscope. But while Ted is a wizard when it comes to asset protection, he can’t do much about the former. Death, it seems, has no loopholes or havens. But there are ways to extend and improve your life. If you live in the U.S., that means tiptoeing through a minefield of high fat and high cholesterol processed foods. Our on-the-go diet does not lend itself to a healthy lifestyle. The No. 1 leading cause of death in the U.S. is heart disease. In 2016, heart disease was responsible for 635,260 deaths, topping cancer at 598,038, according to the Centers for Disease Control and Prevention. To combat this rising tide, pharmaceutical companies like Merck and Pfizer developed a class of drugs called statins. Sold under name brands like Lipitor and Zocor, statins reduce cholesterol levels and help lower the cardiovascular risks that cause heart disease. But treating high cholesterol only solves part of the problem. Statins were introduced back in the mid-‘90s, and heart disease cases continue to rise. The other major factor lies with treating elevated triglyceride levels. An estimated 50 million to 70 million adults in the U.S. have triglyceride levels that put them at risk of cardiovascular disease, even with statin usage. Until recently, there hasn’t been a cost-effective way to treat high triglyceride levels. Statins alone only reduce heart disease risks by about 25% to 35%. But one company has finally come through with an addition to current treatments that reduces your cardiovascular risk by another 25%. That company is Amarin Corp. (Nasdaq: AMRN). Today I’m going to take a look at this high-flying stock and whether it’s worth risking a spot in your portfolio. Biopharmaceutical companies are a dime a dozen on Wall Street. But they attract millions of investors hoping to strike it rich. All it takes is one blockbuster drug, and the shares are off to the races. Amarin is an excellent example. In just two weeks, Amarin stock has rocketed more than 570%. That’s how promising the company’s new medication is. On the surface, Amarin’s Vascepa sounds like something you’d buy over the counter at your local Walgreens. Essentially, Vascepa is fish oil. But not all fish oil is the same. The stuff you buy over the counter includes several omega-3 fatty acids, including EPA and DHA — both of which affect your cholesterol levels. Generally speaking, both EPA and DHA can have health benefits in a proper diet. However, DHA can raise the levels of so-called bad cholesterol in your system. As such, your run-of-the-mill fish oil does little to help those most at risk of developing heart disease. This is where Vascepa comes in. Amarin has processed and filtered Vascepa to include only EPA fatty acids, thus eliminating the risk of raising bad-cholesterol levels. Now, Vascepa has been around for several years. So why all the attention for AMRN stock now? About two weeks ago, Amarin released the results of its REDUCE-IT study for Vascepa … and they were more impressive than anyone believed. While there are many different fish oils on the market, the Vascepa trial proved that the drug reduces heart disease risk by an additional 25% on top of currently used statins. Prior to this study, the Food and Drug Administration had only approved Vascepa for high-risk patients. Now, Vascepa could be prescribed to the lower-risk pool, opening up Amarin to a market in the 50 million to 70 million range. Analysts estimate that this new designation could bring in $1 billion in sales annually for Amarin. And that’s just in the U.S. So, we have a biopharmaceutical company with a new blockbuster drug on the market. Now’s the time to invest, right? If you have plenty of risk tolerance in your portfolio, that answer is yes. For the rest of us, however, we might want to wait until AMRN stock settles down a bit. The shares are on fire right now after soaring nearly 600% in just two weeks. AMRN’s 14-day Relative Strength Index is through the roof at 95.95 — readings above 70 are generally considered overbought. 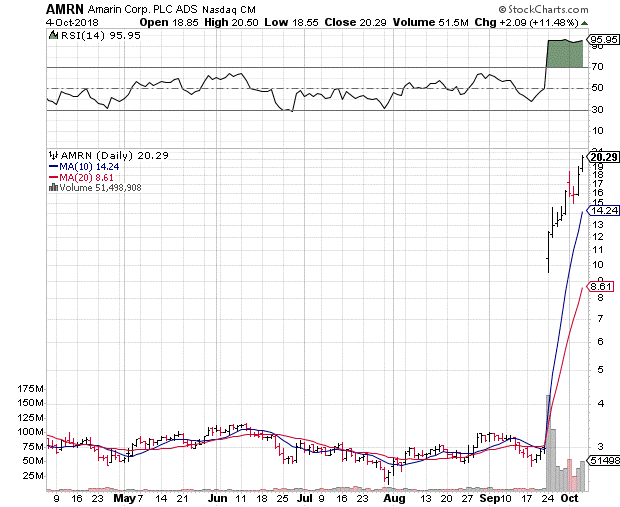 What’s more, AMRN has outstripped every single one of its short-term moving averages. Price support right now is running on pure speculation, and this means increased volatility and profit-taking from those investors who go in early. If you are looking to add AMRN stock to your portfolio, a good buy range would be in the $15 to $17 area. You could also sell out-of-the-money put options to collect a premium as you wait for the stock to pull back to more reasonable levels. Right now, the November $16 put is bid (or sold) at about $2.35, or $235 per contract. Remember, though, only sell puts for stocks that you want to own. Otherwise, you’ll get burned eventually.